The Bermuda Hotel Association [BHA] announced that Mrs. Theresa Harney-Zuill – the Manager of the Royal Palms Hotel – has been selected as the 2015/16 Hotelier of the Year. BHA CEO Stephen Todd made the announcement at the Annual Bermuda Hotel Association / Hotel Employers of Bermuda Christmas Luncheon. The BHA said, “Mrs. Harney-Zuill is the Manager of The Royal Palms Hotel, and has been instrumental in providing the energy, commitment, organizational and administrative skills complimented by her extensive hotel industry experience which has enabled the hotel property to be recognized internationally in 2014 by Feder’s 100 Hotel Awards in the small hotel category, and most recently in 2015 for a further world class award that is directly attributable to the work which she continues to undertake as a dedicated industry professional. “This is further evident through the ongoing high percentage of recent guest who return to the property on a regular basis to enjoy the exceptionally high level of service and standards which Mrs. Harney-Zuill and the entire team provide to enhance their overall guest experience. This is a testament to her management skills and in considering her nomination, it was an easy decision for the committee to make in selecting her as she was the unanimous choice. “During her career she has worked at several properties including the Elbow Beach Hotel & Spa, as a Front Desk Agent, as well as Reservations, Front Desk and Front of House management positions during her 20 years with the hotel. Further key positions were held at the former 9 Beaches as part of their opening team, prior to her joining the Royal Palms Hotel in 2006 as Hotel Manager. “She is a true hotel industry ambassador who believes in providing ongoing guidance, support, and training to her team of 13 full and part time staff members who ensure that the 32 room hotel property is continually operating at optimal service levels. Mrs. Harney-Zuill was presented with her award by the respective Presidents of the Bermuda Hotel Association and the Hotel Employers of Bermuda, Mr. Bushara Bushara and Mr. Allan Federer, accompanied by Mr. Todd and owners of Royal Palms Hotel, Mr. and Mrs. Nick Weare who congratulated her on being honoured by her industry colleagues. 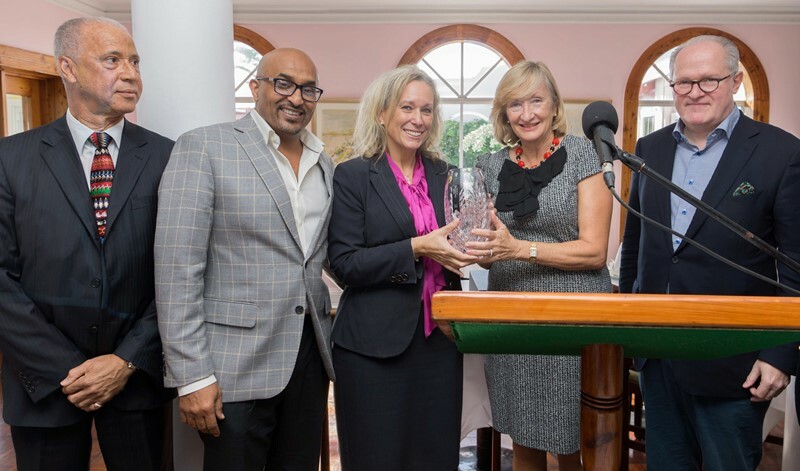 In accepting her award, Mrs. Harney-Zuill stated that she was very humbled and honoured to receive this recognition from her peers, as she accepted it not in a personal capacity, and more importantly she did so on behalf of the entire team at the Royal Palms Hotel, as she said it is a team effort that ensures overall guest satisfaction. Well Done Theresa! Definitely deserved. Congratulations – an excellent choice.